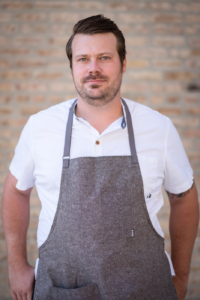 Both David and Anna worked for One Off Hospitality previously, David was the Chef de Cuisine at Blackbird–where he was a James Beard Award Finalist for Rising Star Chef in 2013 and 2014–and Anna was the Pastry Chef at The Publican and Publican Quality Meats. After graduating from the Culinary Institute of America in Hyde Park, David eventually worked at Grant Achatz’ Michelin-Starred Alinea, before working his way up the ranks at Blackbird. Anna, who studied painting and drawing at the Milwaukee Institute of Art & Design, fell in love with pastry after a stint at Le Bec Fin in Philadelphia. She later attended the French Pastry School of Chicago and worked at Blackbird and The Publican—she continues to incorporate art into her pastry work.